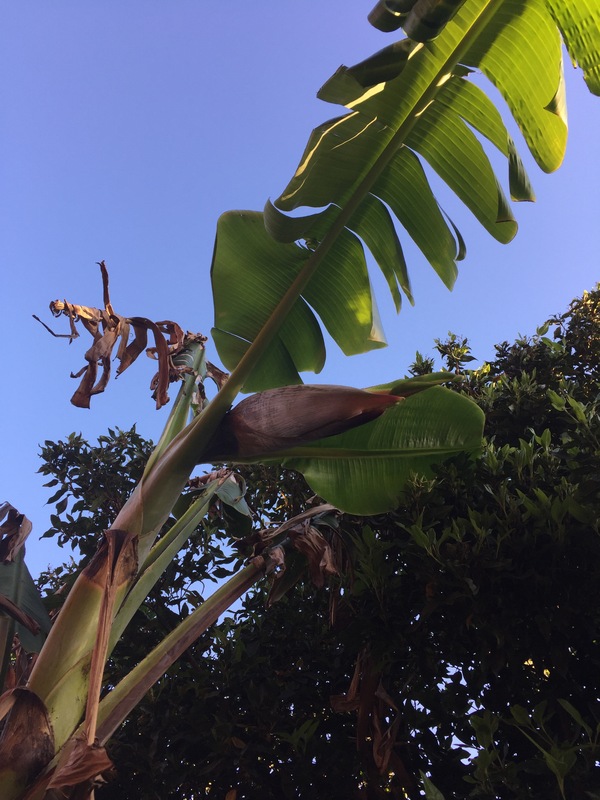 Following the cool ‘flag’ or ‘signal’ leaf that emerged from my Banana plant a week and a bit ago, as predicted, the inflorescence emerged soon after. This flower measures about 50 centimeters long. The sheer size of the flower, to me, makes it so majestic. It’s a shame that due to the weather patterns in Melbourne (sunny one day, windy, rainy and cold the next etc) lots of the main leaves have become shredded. The plant doesn’t seem to mind though considering it shot up a flower so soon and so quickly as well. I hope Carol Klein would be proud … if she ever saw my Banana posts. I do write these Banana entries with a bit of sadness though because as soon as the plant flowers and fruits, it will need to be chopped down as it will start to die. As far as the plant is concerned, it’s sole purpose in life is complete. But with this death comes new growth by way of little ‘suckers’ that form from the main subterranean rhizome. These suckers will ensure the continuance of this particular colony indefinitely.